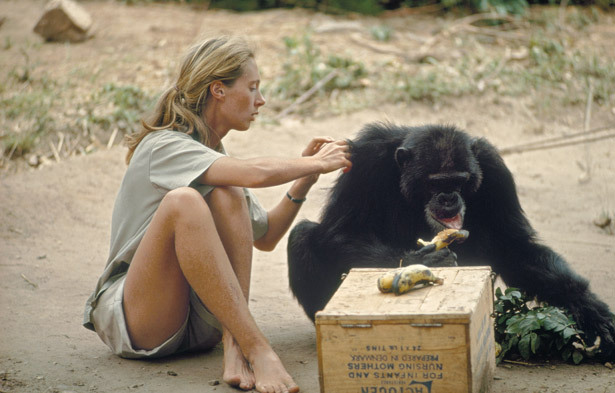 Jane began her journey at Gombe in July of 1960 accompanied by her mother. She was sent into the jungle as only of Louis Leakey’s ‘trimates,’ later to include Birute Galdikas and the late Diane Fossey. 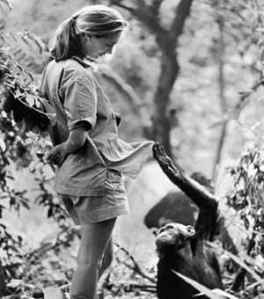 For weeks Jane trekked into the jungle, never seeing a single chimpanzee for more than a few fleeting seconds. Jane eventually learned that if she left out bananas the chimps would come to her. She has faced much scrutiny for what she did to help the wild chimps acclimate to her, but without her research we would have not known about the chimps meat-eating habits, and that they use tools. She was the first to discover this. I have been harboring an anthro-crush on Jane Goodall for many years now, and am continually inspired by her work and those who follow in her footsteps. I was unable to attach the slideshow of a day in the life of a chimpanzee researcher to this page, so here is a link to National Geographic’s page. I highly encourage you to check it out!